The Buzzards is centred around a 300 year old farmhouse that used to be part of a big country estate. Nowadays it combines a bio-dynamic smallholding growing fruits and vegetables with a small nature reserve. There are farm animals and a wildlife trail. You will find the house and ponds all set in sixteen acres. Rare breeds of pigs, sheep and hens all play their part in the organic process. Seasonal vegetables and fruit, eggs and jam are for sale. The Buzzards has a Silver Award from The Green Tourism Award Scheme. There are three traditional, pretty cottages, spacious and comfortable and fully equipped. Bed and Breakfast is occasionally available and is from £35 per person per night. No smoking and no pets in order to ensure an allergy-free environment. Some rooms and cottages are wheelchair accessible. In the morning a hearty organic breakfast awaits you. Organic vegetarian meals and diets are catered for. 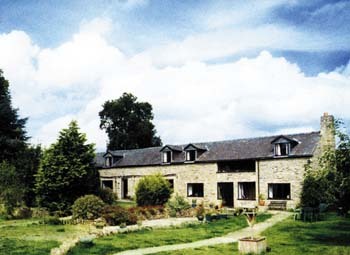 The campsite is a quiet open field, surrounded by trees and next to the hay meadow. Hot shower and toilet are by the farmhouse. The surrounding area offers numerous walking, riding or cycling possibilities through endless woodland and undulating farmland. There are Areas Of Outstanding Natural Beauty (Malvern, Wye Valley, Cotswolds, Shropshire Hills) and National Parks (Brecon Beacons, Snowdonia) nearby. Also nearby are the long distance paths of Offa's Dyke and the Mortimer Trail. There are National Trust and English Heritage sites to visit. Annual music and food festivals at Ludlow and Presteigne.